A bright red hangnail, a deep scratch, a red spot in a weird place—no injury is small enough to ignore. Even a small injury can turn serious if not cared for, so make sure you know the signs of inflammation, signs of infection, and how to reduce your risk. With more viruses in circulation and more bacteria strains becoming antibiotic resistant, it’s worth watching even a small cut or scratch. For extra immune support for the whole body, make sure you’ve got colloidal silver daily supplement. You probably know about some minor skin issues—whether it’s broken skin from a rash, a foot injury (blisters from shoes or a scrape or small puncture), or just an ingrown hair or hangnail. Besides keeping an eye on them for signs of inflammation or infection, you should periodically use a mirror to check over your body for breaks in your skin you may have missed (and it’s a good way to keep an eye on moles, too). A red spot that doesn’t heal,, which could just look like an ingrown hair or acne, could be MRSA. MRSA starts out small, but can quickly spread and be hard to fight. Many people naturally carry MRSA on their skin, but it can also spread from communal objects—at the gym, salon, spa, or hospital. Not every red spot is MRSA, but with the consequences so high, it’s a reason to keep an eye on even the smallest of injuries. Alternately, a small injury could be a gateway for a more serious infection, which are becoming more common (lakes and beaches, for instance, are more likely to carry scary bacteria these days). What are signs of inflammation? Signs of inflammation include redness, pain, and swelling. Inflammation isn’t usually an emergency, but if you have it keep a careful eye on the spot, and call a doctor if it gets worse, or doesn’t get better within half a day to a day. Signs of infection start as more severe signs of inflammation—bigger swelling, bigger pain, and an “angrier” redness. 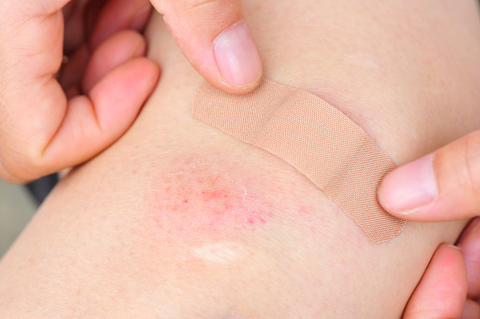 Signs of infection can also include redness in the form of lines branching out from the wound. Pus, fever, swollen lymph nodes, and the symptoms spreading out (a larger area experiencing pain, or new symptoms) are also signs of infection. See a doctor immediately if you think you have an infection. Colloidal silver has been used for centuries to help improve and speed healing, and can be used as a dietary supplement or sprayed directly to the skin. Some over-the-counter ointments even have silver compounds in them, but colloidal silver is a cheaper, safer (silver is the only ingredient, and only allergen risk), easier solution. Just spray a little silver on any spot on your skin and let dry a second before applying gel or a bandage. Keep colloidal silver on hand for all your minor cuts, scrapes, rashes, and more, to help support healthy skin.